There’s my shoe storage system. 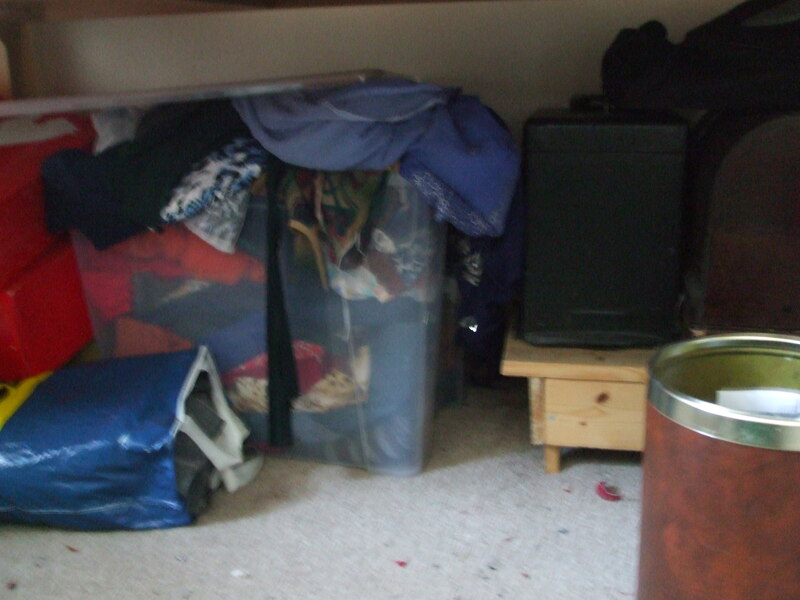 and a fabric-covered wardrobe wherein we hang storage for bedding. I also have two bags of knitting paraphernalia even though I rarely knit. There’s an enormous crate of costume-y type fabrics, like crystal organza, and old curtains. There are several boxes of steampunk bits and bobs- hats, parasols, accessories, which is an annoying business as I usually have to tip the lot out to find the glove I want. There’s an old hatbox full of wigs, and another for masks. On top of the book cases, several boxes of art supplies [I WILL get back to my art at some point, I will] and things-which-have-no-other-home, like the box of beautiful Bath glass we bought on honeymoon, but is waiting for its permanent home-to-be, and curtain fixings of various types. A gigantic stuffed black panther, which had a home at our last rental, but fits nowhere here, and my treasured Bagpuss. The dining room/sewing room has a large racking shelf unit which holds 6 crates/boxes of fabrics, zip bags of zips, interfacing, and binding. Two storage boxes of thread, one of buttons, and my tool kit, as well as a small tool storage box of bitty bits like safety pins and bag making bits. And the crate of shame and a heat gun..
it’s also got that Japanese screen with various ‘quick’ alterations and fixes on top…recognise any? 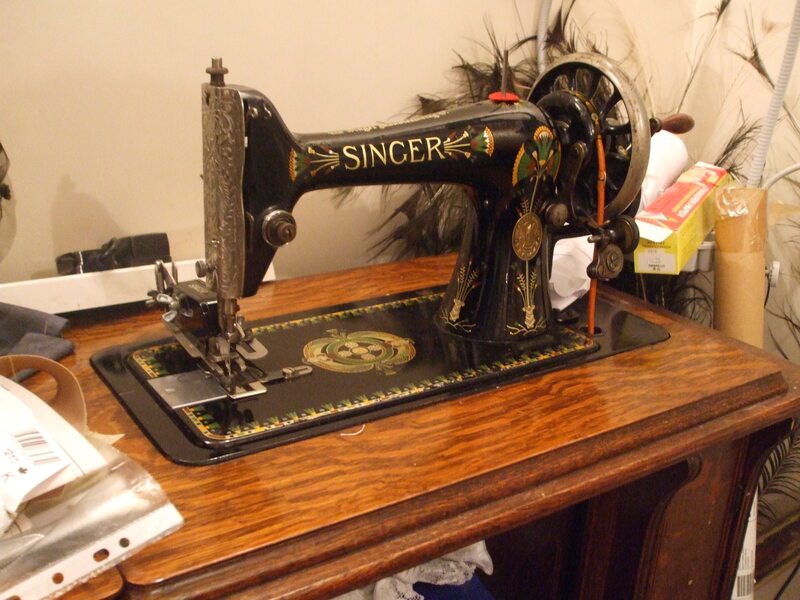 There’s the 1911 treadle Singer, which is currently invisible under the piles of stuff on top, a small plastic drawer unit containing more patterns and habby-in-waiting. A bag of overlocker threads which are supposed to be upstairs, and a half-finished Victorian petticoat shoved under the Singer. Ah yes! THAT’S what she looks like! Under the dining table, two more sewing machines, a crate of fabric I sorted out in the summer to sell on FB [still not photographed or listed], two large boot boxes containing the rest of the stuff for the temporarily abandoned cathedral window outfit and some pieces of leather and faux leather to help them not get crushed. There’s a box in the corner with various rolled up large PDFs, drawing paper, and other rolly-things. And some dud peacock feathers I bought which turned out to be useless, as the fancy ‘eyes’ had been cut off. On the windowsill, usually my cantilever sewing box and a few other boxes with bobbins and so on, plus a file thingy for patterns-in-progress as well as a box with calculator, stapler, drawing pins and so on. AND the iron and ironing board, pressing gear and…and…and. 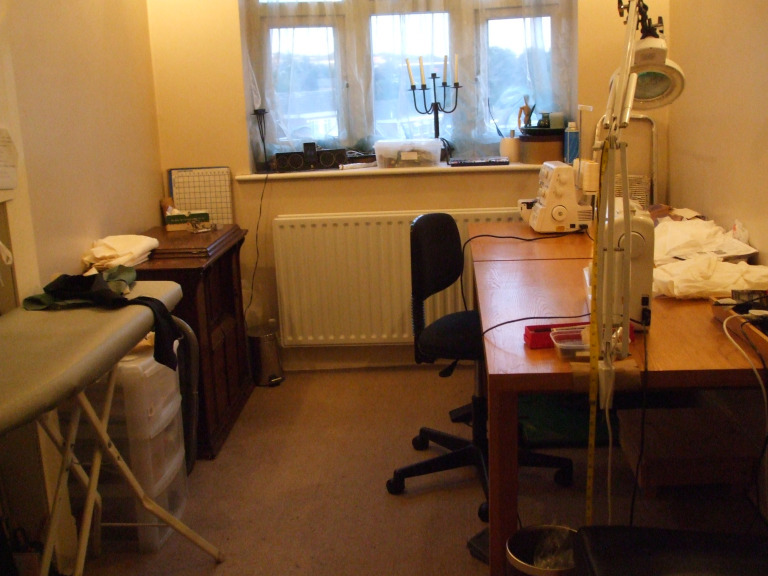 All that in a space which can JUST fit 6 people round the dining table if you take the treadle machine back out. It’s minute. Time for a spring clean, or blitz which is more to the point. Next stop, patterns. A while back I made a spreadsheet of all my patterns…but the file has vanished [probably last time my PC died and we only recovered SOME files. I had to start all over again, this time saving to an external drive. I began by re-typing everything from the previous print off, adding in all the pencilled on purchases, and put it into order, including even adding notes to things which had stalled at the toile stage etc. I NEVER do this as I go, it’s not how my head works. I’m pretty certain there are a few more which have been bought and either stashed or used without listing them, so this list can only grow at the next stage, prior to an attempt at a mini-kondoing. The relatively small percentage of patterns which I have NOT made up, will either be made up this year, or discarded. Patterns I HAVE made up but which will not be made again, are being binned [well, recycled anyway] No point passing them on as I always cut my patterns to my size. At THAT stage, with those items re-housed, I expect to gain a drawer or two which can comfortably house my steampunk accessories in a more accessible manner than the current shove-’em-in-a-boot-box method. There, now I’ve shared my shame, I HAVE to improve the chaos! Sewing is the best and only therapy for me when I’m stressed…and years of costume making tells me that EVERYTHING will be useful sometime, making it hard to chuck things away as I always need them a few months later! Scraps are going to become pouffes this year though, and will be Xmas presents in due course! Great reading and pics accurately represent what some of my spaces look like 😦 Off to look in the other 4 tubs I haven’t opened in a long while. Sam the Aussie. Completely sympathise – don’t understand how it gets to that messy stage although its the slow insidious creep of accumulation which finishes me off. The fabric that accumulates on the bed until you can’t see the bed anymore, the patterns which are popped down until the pile falls over. 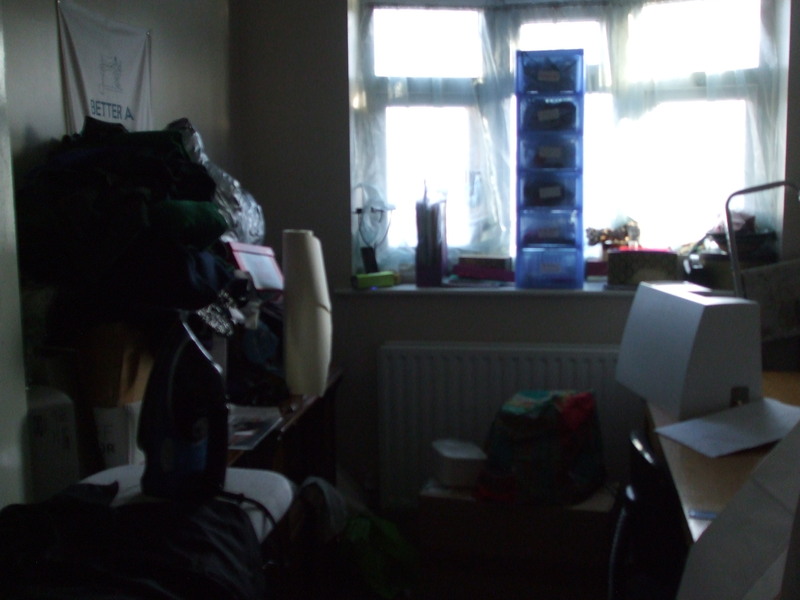 Currently after the small plumbing leak much of the sewing room is in our bedroom and there is so much of it how did it fit in the sewing room? lol at least it doesn’t spread to bedroom or living room, just my insane piles. It WILL be tamed, but then resume the inexorable decline until it’s back again of course. Ah well, I don’t tidy anything else! Yes I understand your chaos but if you tidy everything then you won’t be able to find anything and you will then have to spend time looking for what you need. Well that’s my excuse for not tidying. Wish I could bring myself to prune some of my own pattern collection…fabric seems like it will always come around again but patterns seem more unique somehow. Well done for tackling it! Thank you so much for sharing this. 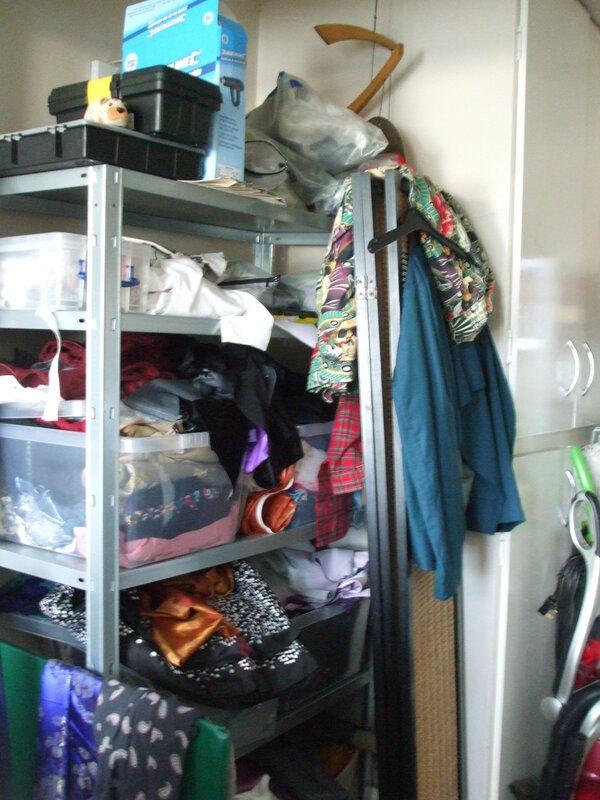 I often feel like I (or someone who writes much better than I do) needs to write a book in praise of hoarding to counter the “de-cluttering” movement. We’re building a house though so when we’re ready to move into it I will probably be doing some de-cluttering though. You’re pattern inventory sounds like a wonderful idea. Do use a special program or just Excel? I have gone as far as having photos of all my dresses, or whatever, in one computer file so I can look at them all at once. I love your sewing room. My stuff is perpetually put away in plastic tubs because I don’t have a dedicated room yet. 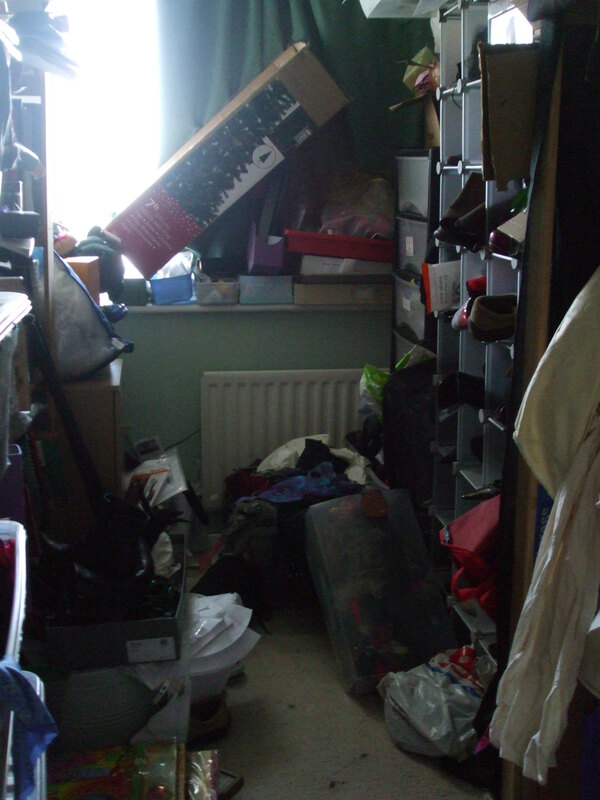 It takes an incredible amount of time and energy to sort and toss and catalogue – good for you! Just Excel- I thought it would take forever to retype the 250-long list, but it was a doddle. I have kept it simple, Pattern compcny, number, brief description, then several columns to help me recognise if I’ve used the pattern, who for, a few categories, and a sparse notes option at th eend. EG first column is to indicate if I’ve made up the pattern once [one asterisk] more than once [two asterisks] or only partially [some other symbol]. If I’ve made it up for someone else [not many lol] I havea column where their name or initial goes. Then my categories are for lingerie/accessories/historical & costume/evening & bridal/children. It seems adequate. I’m considering copying to a fresh page and categorising more tightly by skirt& trousers/dresses/tops/ but haven’t got that far yet. I did rearrange the patterns [for the time being] roughly into those categories which made getting them into the drawers more simple! I use Trello for patterns as I needed to learn how to use it for work. I can update it on the PC as well as my phone and it means I can gaze at the patterns when away from the house. I like that, it minimises the buying new patterns. I use Cora for fabrics, but it only works on the phone. Am thinking about switching fabrics to Trello. Marie Kondo lost me at the “only 30 books” point. WHAT? Even keeping to just 30 on one topic would be difficult. I do like the regular Melbourne sewing stash swaps we have. They are terrific for clearing out the sewing clutter and allowing for lovely new things. I found the best way to de-clutter was to move 6000 miles and decide what was not worth putting in a shipping container. Had to minimize the stash when moving to the UK and then 8 years later, narrow down the stash again when moving back to the US. Found a great place to drop off bags of fabrics and buttons…a Catholic convent where nuns made clothing for children in Africa. Makes my heart sing to think of all that gorgeous material now being worn by kids and their moms and not filling up my sewing rooms while I sort out fussy brides. That said, after my folks moved into assisted living and we had to clean out their house with 70 years of hoarding, I wish my mother would have spent a bit more time tossing stuff out and didn’t think having 3 of everything was such a good idea…3 crock pots, 3 coffee makers, 3 bathroom scales, 3 electric blankets and hundreds of crystal glasses for 2 old people who never entertained. I know what you mean! My ma and pa have loads of glassware and knick knacks [and they don’t even LIKE them] I have my eye on one or two items, but that’s all. My fabrics though, my preciouses! Next Next post: Oh just Zip it will you?